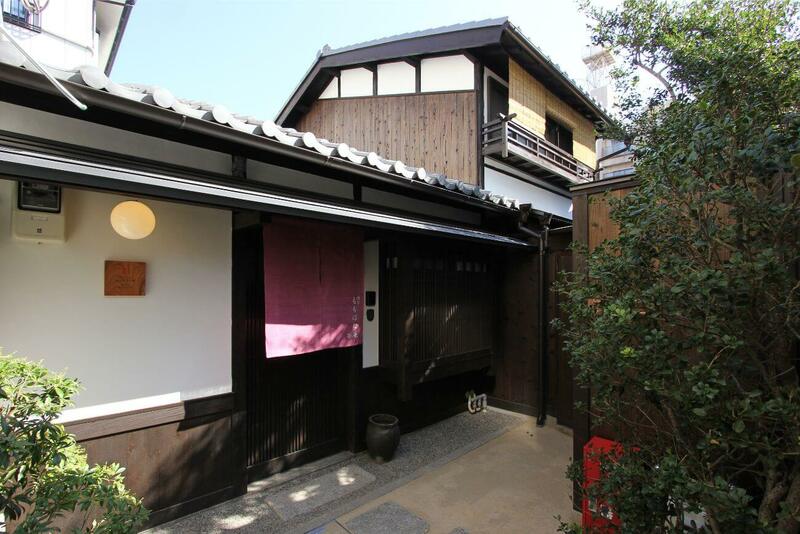 Shouki-sama, displayed above the edge of the roof, is a deity believed to protect the home. 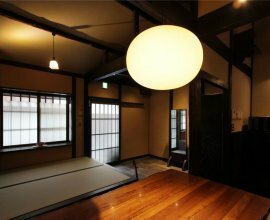 "Momohana-an" features a traditional Japanese interior with tatami (woven-straw) floors and shoji paper sliding screens. 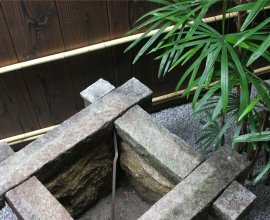 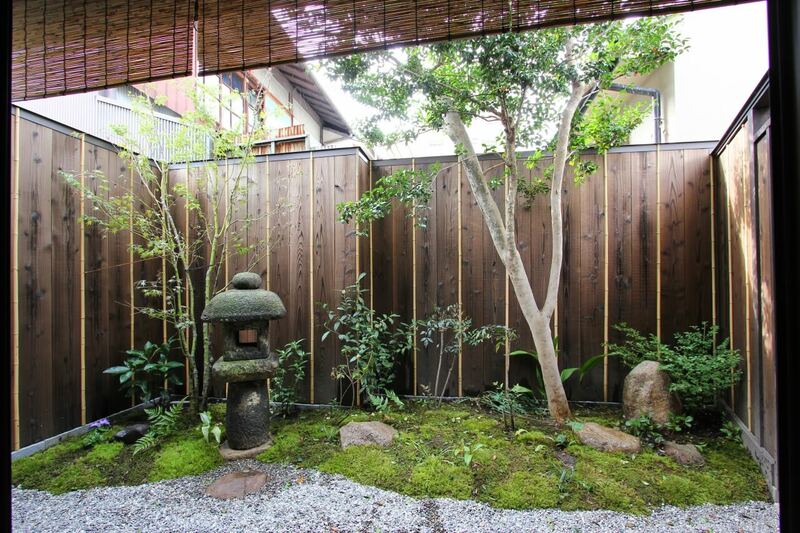 Although it is located near one of the busiest shopping districts in Kyoto, this machiya is tucked away from all of the hustle and bustle of the city to provide you with a moment of tranquility during your time in this historical city. 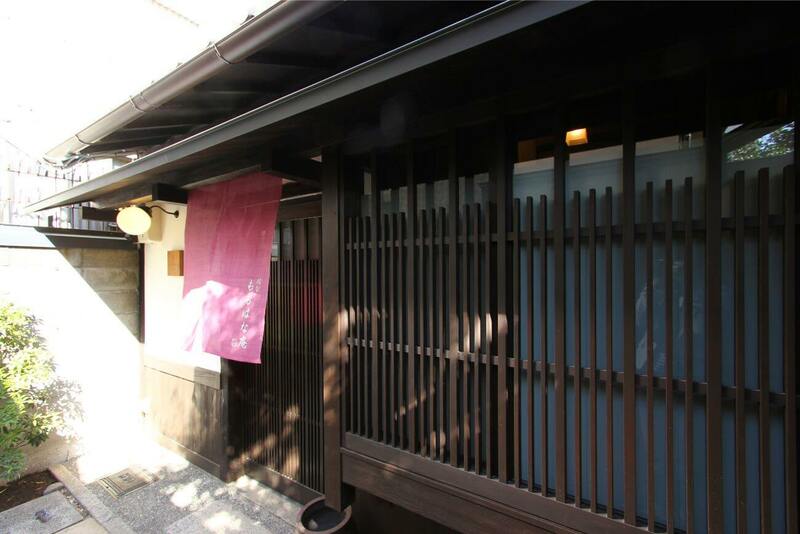 Like many traditional machiya, "Momohana-an"served not only as a living space, but also as a store. 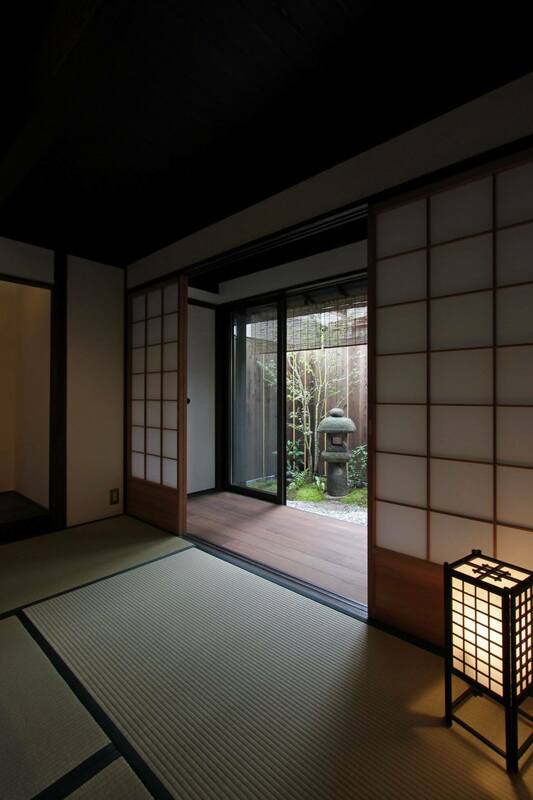 After entering through the lattice door in the entranceway, you see the 'Mise-no-ma' space on your right. 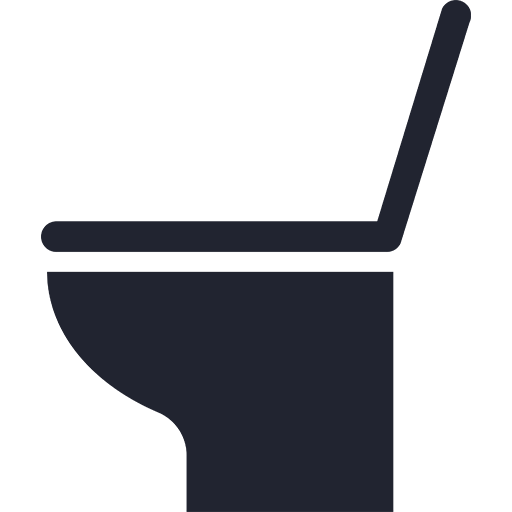 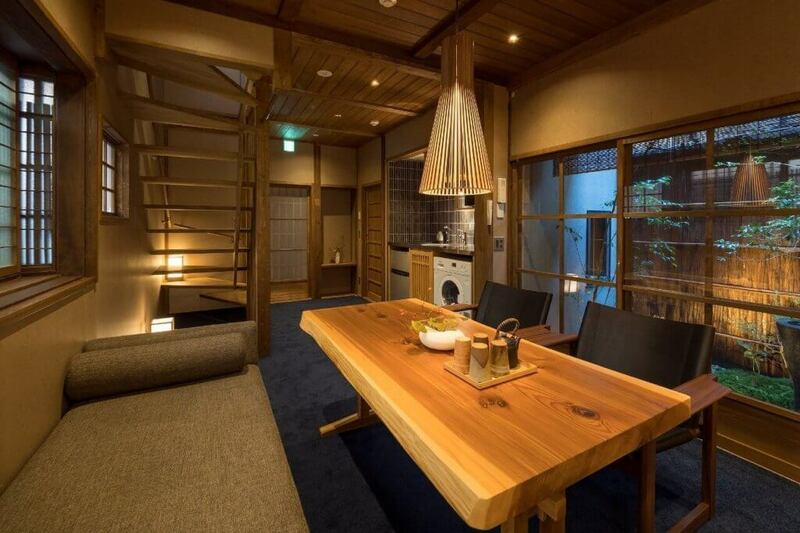 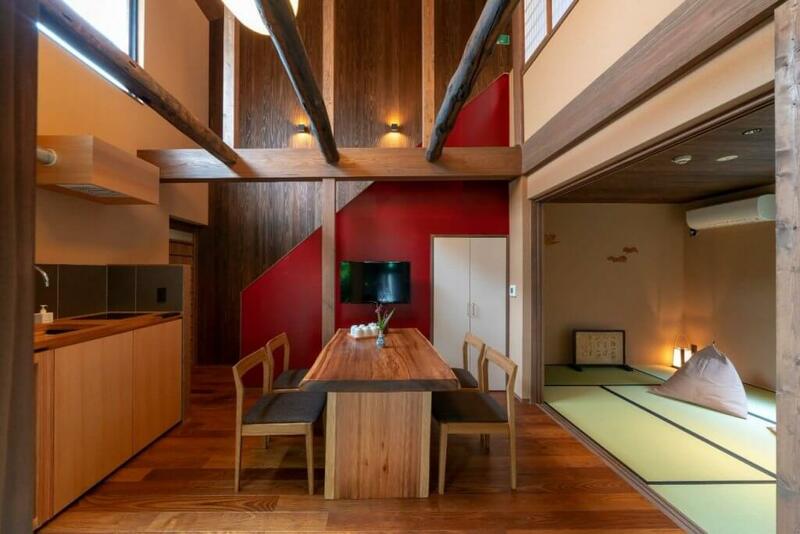 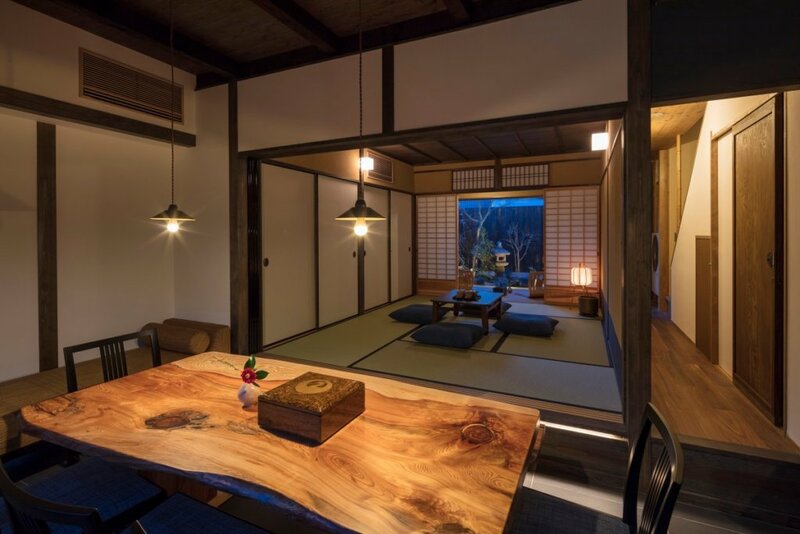 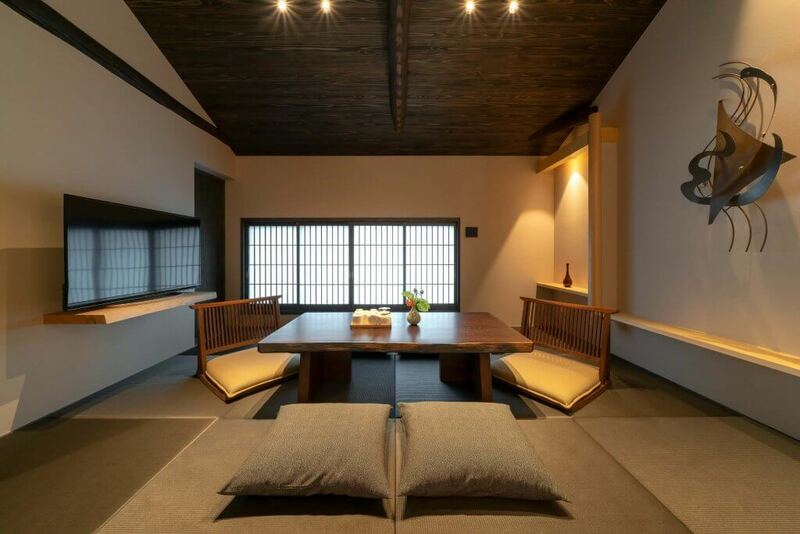 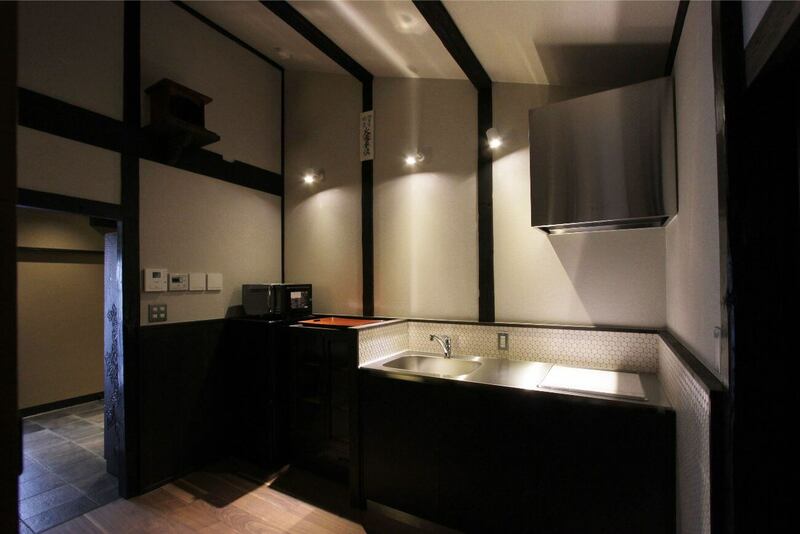 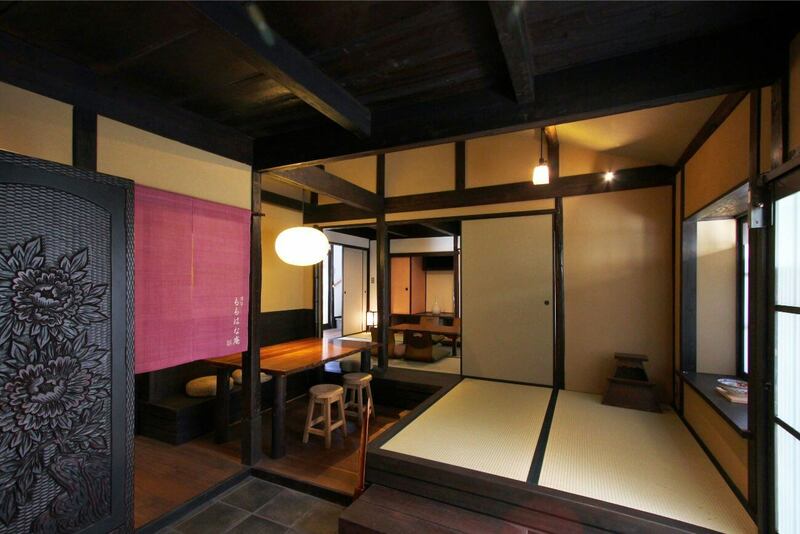 The 'Mise-no-ma' is a traditional part of a Kyo-machiya floor plan, used as a space to conduct business with guests. 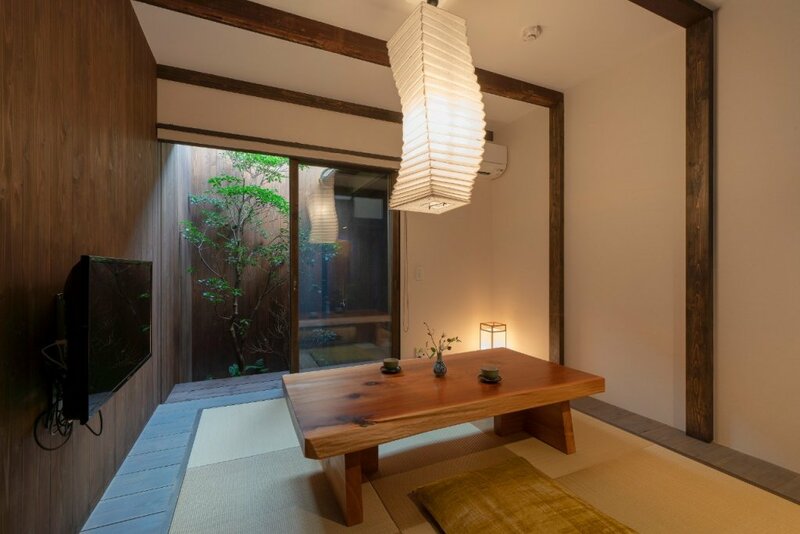 There are also highlights such as the large dresser on the earthen floor, which showcases a rare example of Kamakura style carvings, and the mud wall on the stairwell. 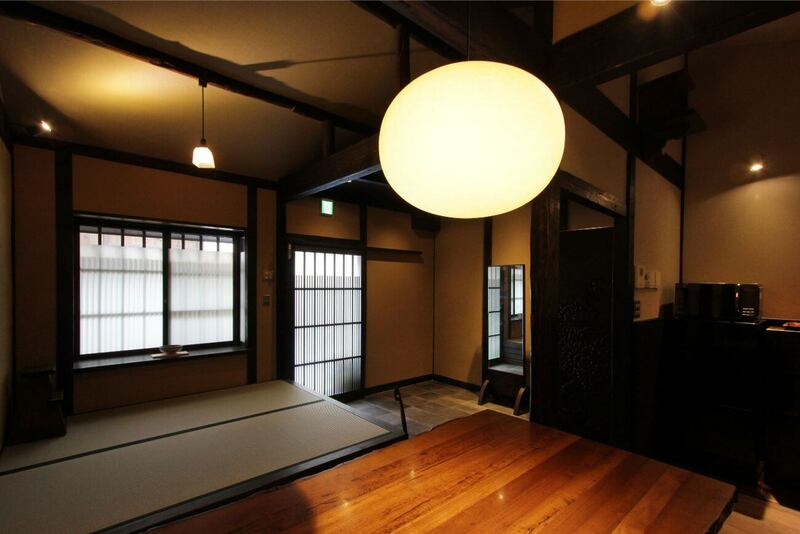 Classic Kyo-machiya front room Upon entering, notice the 'Mise-no-ma' tatami area that was once used as a public space to conduct business with customers. 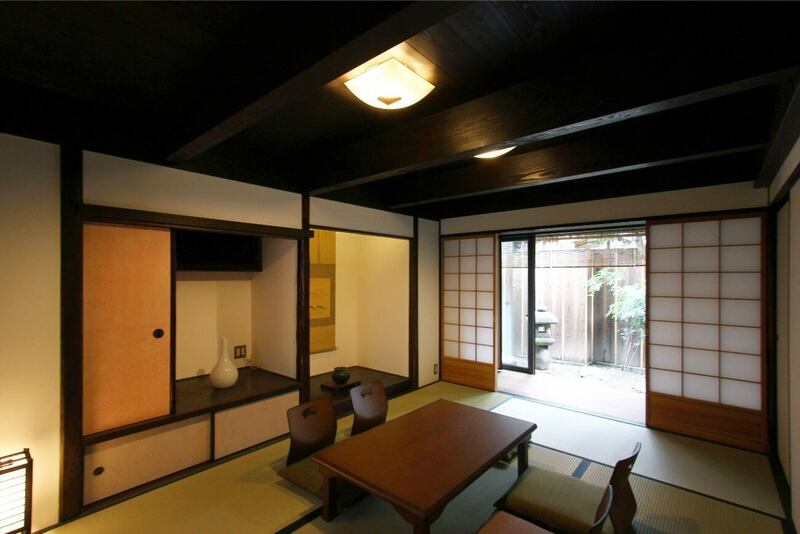 The front room also has a dining area. 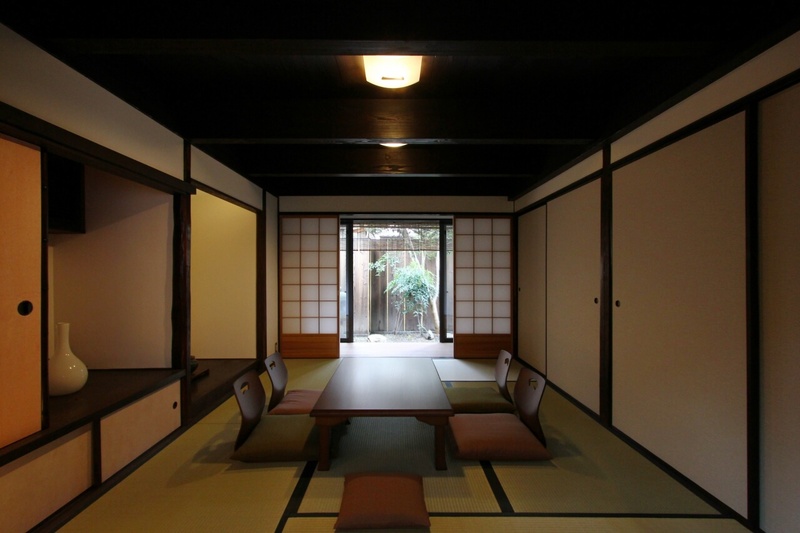 Enjoy a meal here. 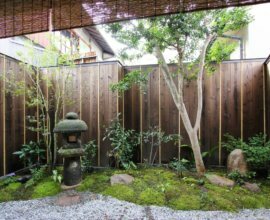 Two ‘tsuboniwa’ gardens A special feature of this machiya is its two beautiful Japanese gardens that bathe the 1st floor in soft natural light. 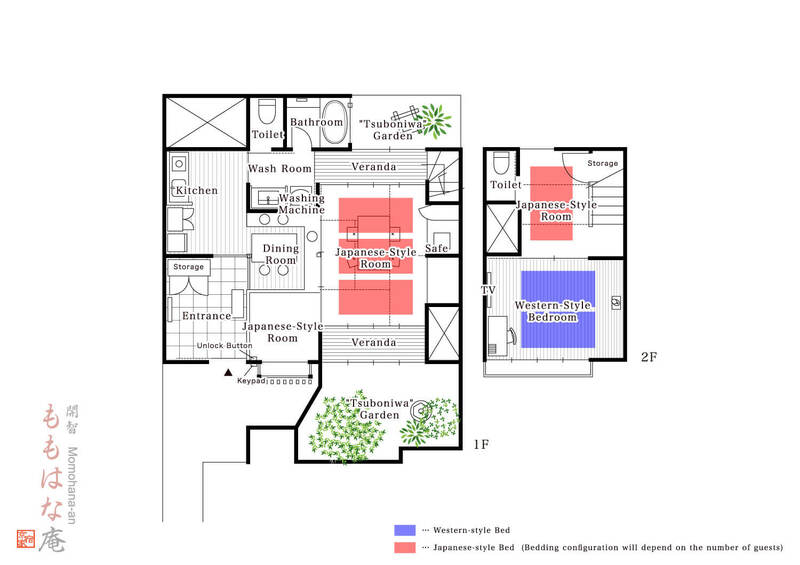 Enjoy the luscious views from the living room, dining room and veranda. 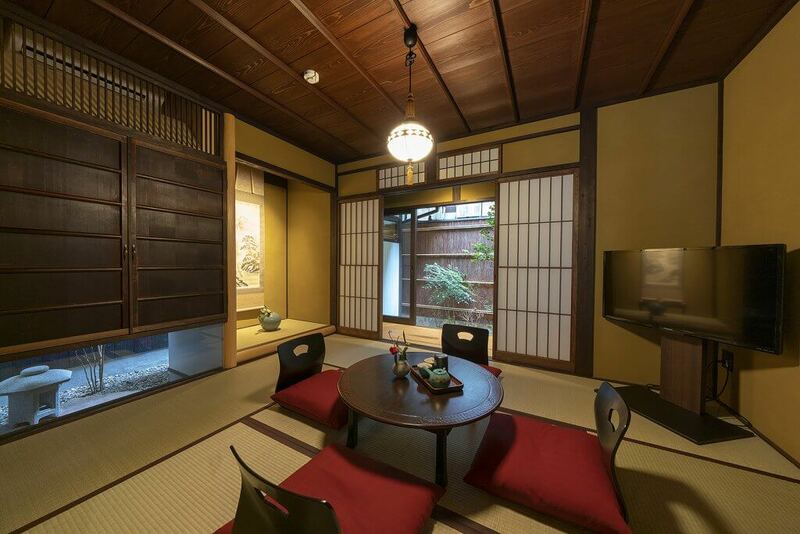 Japanese living room Imagine life in traditional Kyoto as you relax in the living room. 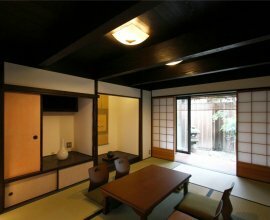 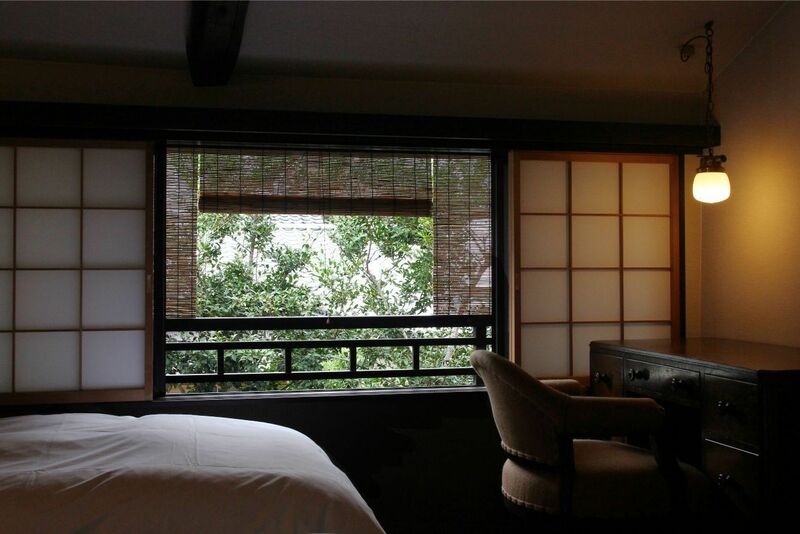 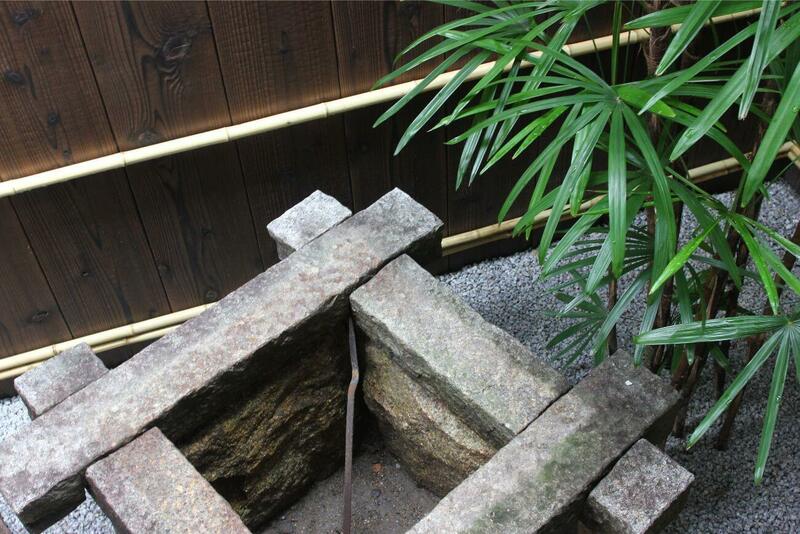 Look out onto the two gardens, admire the ‘tokonoma’ art alcove and original architecture of this machiya. 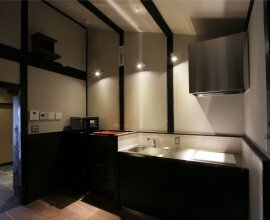 Kitchen With fresh, local ingredients, prepare your favourite light meal in the furnished kitchen. 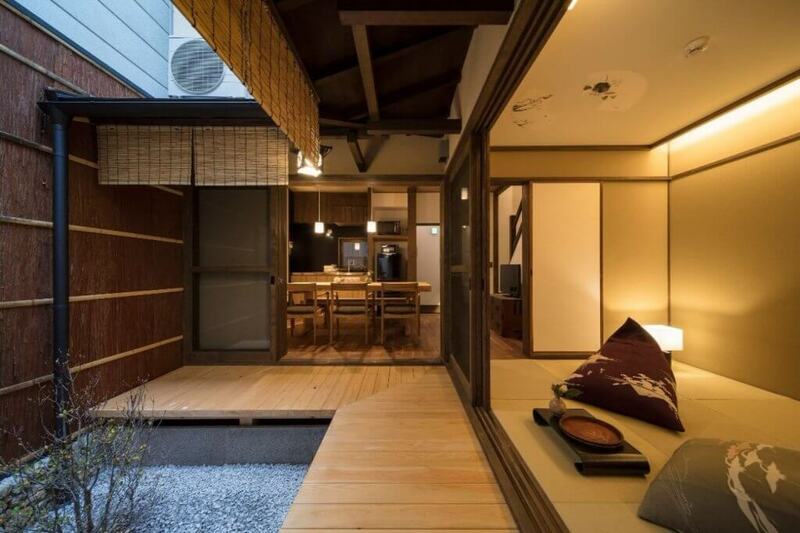 The sleek design introduces a modern touch to this traditional house. 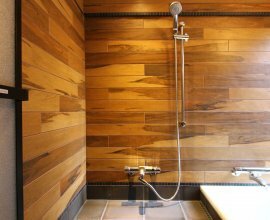 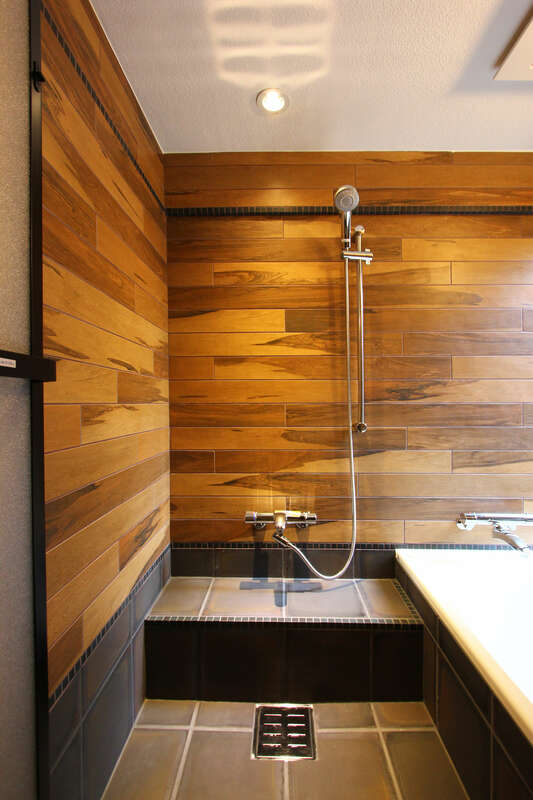 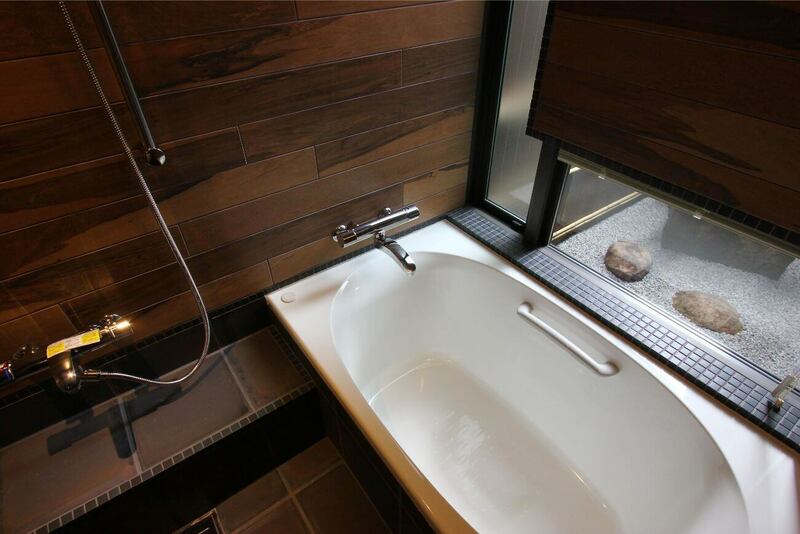 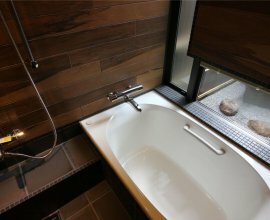 Bathroom Pamper yourself using our custom bath amenities as you enjoy the view of the rear garden in the bathtub or under the shower. 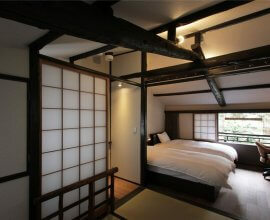 Bedrooms Close the ‘fusuma’ doors to create two bedrooms. 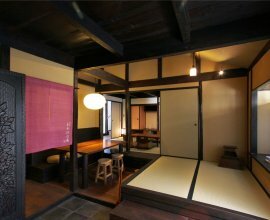 The Western bedroom has an antique desk and a TV. 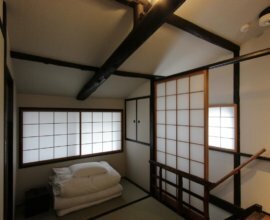 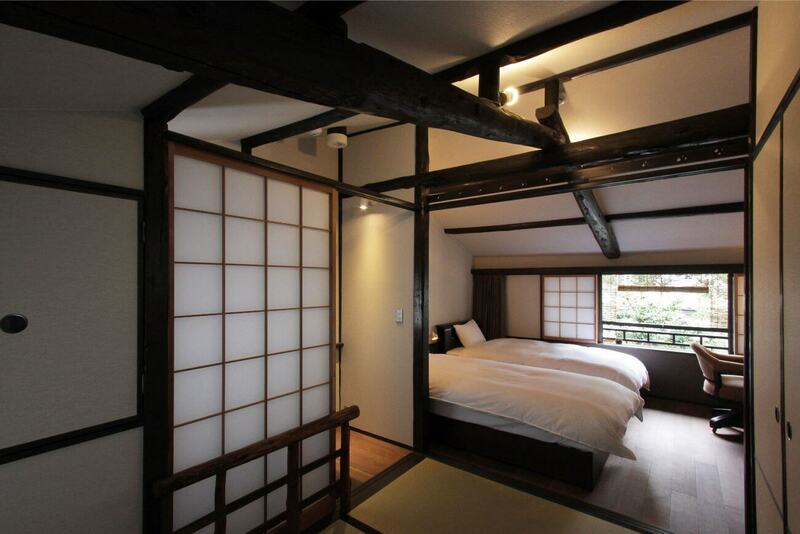 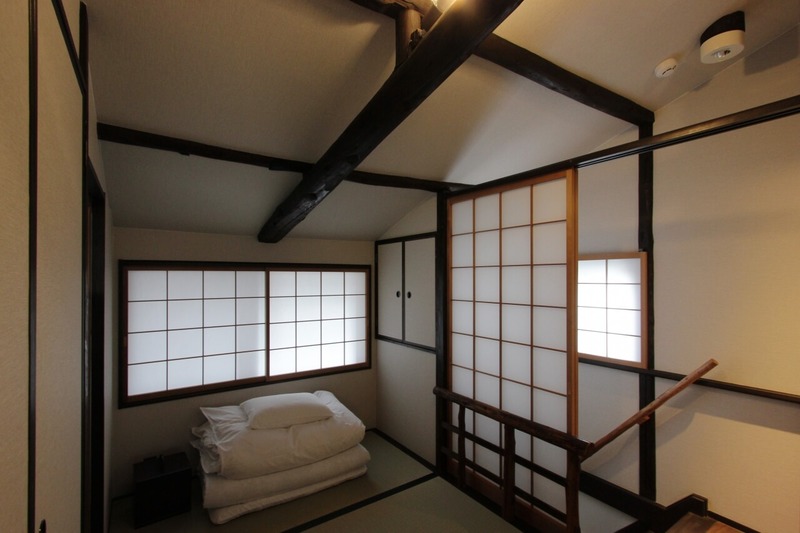 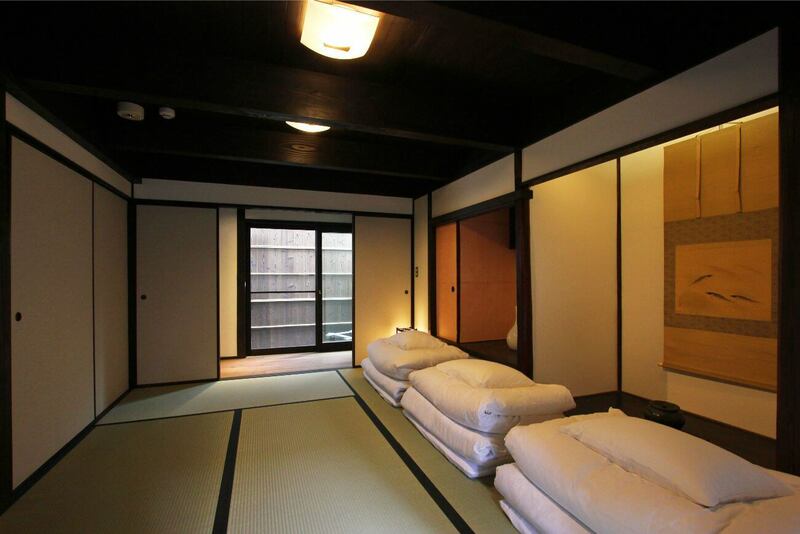 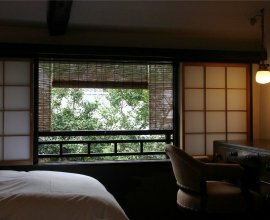 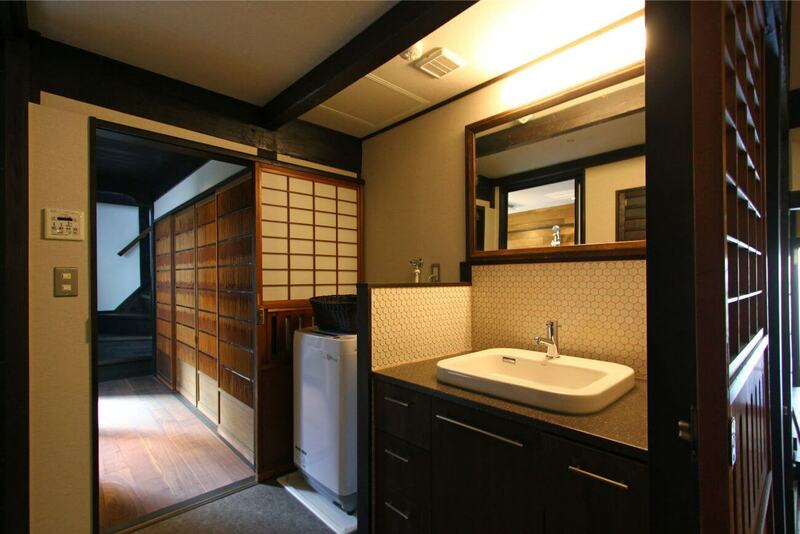 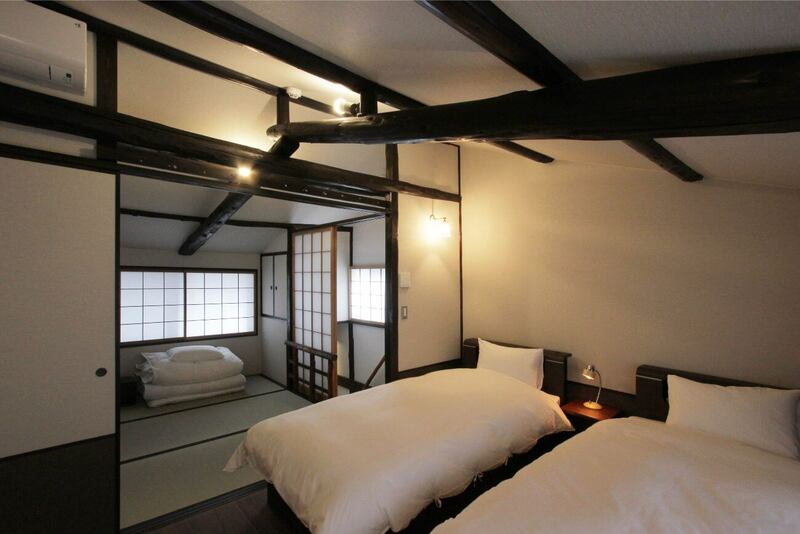 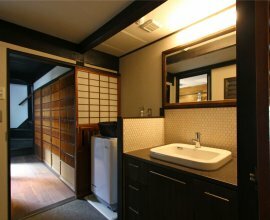 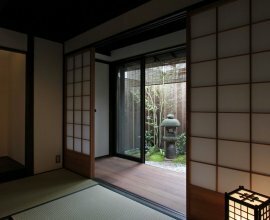 The Japanese bedroom features tatami flooring and shoji paper doors. 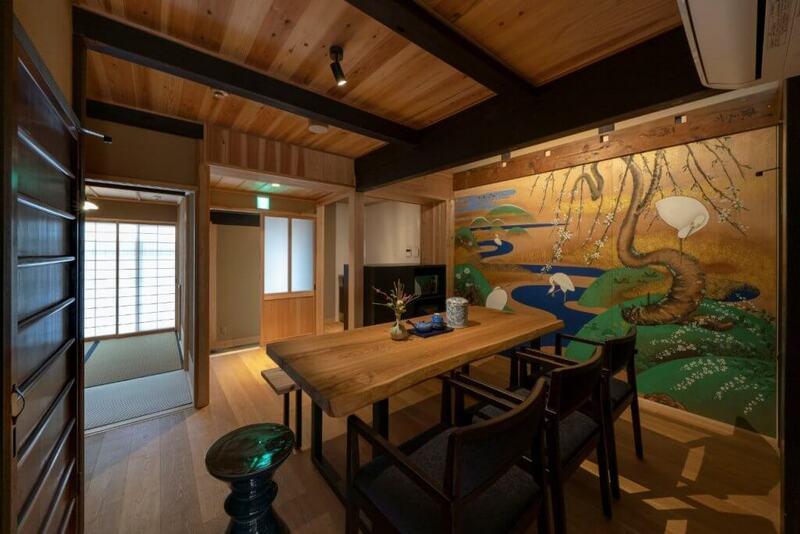 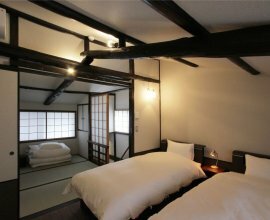 This machiya house is located between Shijo street & Kawaramachi street to provide you with easy access to the main shopping & dining district, in addition to the most popular sight seeing attractions. 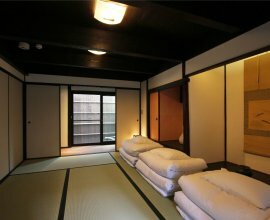 A 10-minute walk East will lead you towards the popular Gion area, while 1 subway stop north will bring you to the Kyoto Imperial Palace. 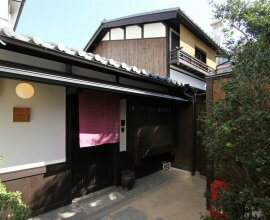 We also recommend renting a bicycle from a local rental shop to explore the city. 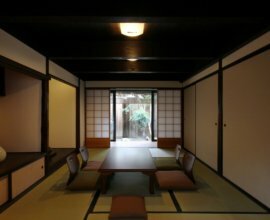 A 7 minute bicycle ride can take you to Kenninji Temple, while a 15 minute bicycle ride will lead you towards Nijo Castle. 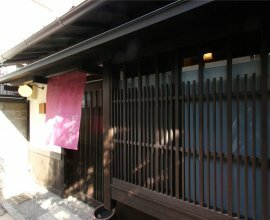 Visit Nishiki Market -- an outdoor market popular amongst locals and visitors alike to pick up fresh produce, local ingredients, or handmade delicacies.